A quilt without personality is just a blanket! That’s the insight from today’s guest whose artistry is teaching how to add character to our quilts, using machine-quilting techniques. Join today’s guest Lori Kennedy, who has developed a novel, very learnable approach to free-motion quilting techniques on Free-Motion Quilting 1-2-3, today’s new episode of Sewing With Nancy. Nearly 15 years ago, Lori started a search for the quilting techniques that fit her personality. Through trial and error, she found a system that worked. Today, she’s sharing it with our viewers. During today’s new episode, you will learn to stitch a variety of motifs—some of them look complex. But, once they’re broken down into manageable steps, they’re easy. Start with a straight-forward motif, such as these Easy Loops. Lori shows us how to create this versatile stitch on Sewing With Nancy. Stitching Spiral Roses is easier than making spirals, these roses don’t have to be perfect to look beautiful. In fact, if the stitching is a little messy, it enhances the character of the design. Watch as Lori demonstrates the Spiral Rose. Next, how about a little Flower Power! Use this free-motion quilting technique as the background of your next quilt design. What may look complicated is very doable, once you learn Lori’s common-sense approach. Add whimsy to a square block or half-square triangle block with the multipurpose Square Flower design. Not to worry, precision is not recommended! This design can be offset or symmetrical. Curious? Lori has the solution on Sewing With Nancy. Lori Kennedy and I will inspire you to practice making attractive free-motion quilt designs on your domestic sewing machine. Mark a representation of the design area on paper. Doodle with pen or pencil on paper to foster hand-eye coordination and build muscle memory. Start with an easy design of loops. Use a variety of flower designs. Make Spiral Roses with variations for borders and grouped roses. Add Flower Power for a versatile fill design. Use Square Flowers with variations for borders, as well as half-square and circle blocks. Watch Free-Motion Quilting 1-2-3 (Part One) on Sewing With Nancy online. For a chance to win a copy of the new Free-Motion Quilting 1-2-3 DVD, from Nancy’s Notions, leave a comment sharing what size quilt you create most often. The randomly selected winner of a copy of the new book, 101 Renegade Sewing & Quilting Tips book, from Nancy’s Notions is Lory Wood. I make over-sized king quilts. Actually just one so far. I recently purchased a sewing machine with 12 inches between the motor and needle. With that much workspace I have been able to expand my quilting to just about any size! Freedom is a wonderful thing! Now I am hungry for patterns and eager to try them all. Thanks for presenting Lori Kennedy on your show. She really does make quilting easier than it looks and my results have been amazing! Lately, my favorite size quilts have been table runners and seasonal wall hangings, because I can get a quick quilting and applique fix with these fast and fun projects! Hard for me to say what size of quilt I make most often, as it seems they vary so often. I just finished a king size plus, which is a bit rare for me, although I do make king size at least once a year. Guess I’d have to pick queen size as what I make most often. I usually make wall quilts and baby quilts. They’re easier for me to quilt than larger sizes, though I have quilted a queen size before. I usually make a wall hanging version of a quilt design that I like! This is partly because I don’t need any more big quilts~no place to put them! But, mostly because there are so many I want to make and so little time! So, smaller sized wall hangings work out perfectly! The size I make the most of are lap quilts. Most of mine are Queen to King size, and I quilt them on my domestic….learning a lot about free motion quilting here. May your trip to heaven be as fast as a straight stitch with no zig zags. You have been our sewing angel on earth. Thank you so much for all you’ve taught us. I hope to see you at a quilting retreat in the sky someday. God Bless you. I usually like to do smaller art quilts, but really mix it up with bed quilts and throws also. I usually do basic FMQ, but would love to learn how Lori quilts with such an even flow. I found it fascinating to watch her. I mostly do twin or queen size quilts. I’ve appreciated Lori and Nancy’s valuable information to aid in my quilting. I just finished a border with the scalloped leaf. Turned out beautifully and oh so easy. I am making all sizes from minis to queen. Most often big lap size 75 x 80! I have been sewing and quilting several Quilts of Valor for people I know in my life. Started one for a neighbor that turned out Queen size as I made it to pertain to his life and now working on one for a guy I knew 50 years ago. I wrote to him in Viet Nam for couple years and recently found him to learn his service to his country turned into him being a fire fighter and later a police man so have incorporated that into his quilt this quilt is full size. These days, my completed quilts are Quilt of Valor size. They are the only ones I seem to get finished! Notice I said completed- I have lots of different sized tops waiting and waiting…….but those QOV are a priority for me these days. Although I prefer making lap/TV sized snuggle quilts I tend to make oversized queensized quilts as gifts. I make my teen autograph quilts throw size. Most of the quilts I have made have been Queen sized. But I have also made several twin sized quilts for baby quilts that can continue being used for many years. Throw and twin size are my favorite. Easy to quilt in a domestic sewing machine and big enough to cuddle and get comfy. I make baby size, and queen size the most. Thanks for the chance at winning what looks to be a wonderful book. I make all sorts of quilt tops in all sizes. I would dearly like to quilt my own. I have many UFOs that are in need of finishing. A resource liek this would be wonderful to give me the knowledge to deal with large amounts of fabric in the throat of my machine! Thank you for bringing more ideas and resources to the general sewing public! Your work is phenomenal! and your tips are much appreciated! My favorite size of quilt to do machine Quilt on is baby. I usually do straight stitching, but am trying to be brave and do more free motion quilting. Many baby Quilt tops are donated to my quilt Guild, so I volunteer to take the tops so I can practice free motion quiltIng. Practice, practice, practice! I like to free-motion pebbles and wavy lines. They seem to come more natural in free-motion. Mostly I work with queen sized quilts even though I am new to quilting and free motion. Free motion quilting is so much fun and I have a lot to learn yet. I’ve made queens for my family, twins for my grandchildren, and many baby quilts. I find I piece the fabric just to get to a beautiful canvas for free motion quilting on my Janome 8900! My boys keep giving me more babies so baby quilts are what I’ve made most. I have also made some wall hangings and placemats. Trying to work up the nerve to try something larger. Since my machine quilter moved away (! ), I have only worked on small projects: table runners, wall hangings, baby quilts. Like the lion in the Wizard of Oz, I need to find the ‘courage’ to tackle bigger projects. “Whatta they got that I ain’t got? Courage!” – or maybe just your Machine Quilting 1-2-3 book! I’ve only made baby-sized quilts so far (and only done stitch in the ditch). I’m just starting to learn free motion and would love to win this book! I haven’t made quilts, but do quilt fabrics to make purses. I think the free motion would look so good and I’d love to learn them. Thanks for the chance to win the book. I can’t wait to try this. Prayers for Nancy. Twin size is my most common because it is what my kids like for watching television. It is also what most shelters ask for when donating. I make all sizes from baby to king size. My favorite is baby quilts because they are quick. It would be nice to win this book for free motion quilting. My favorite size quilt to quilt is about 36 by 36, wall hanging size. I have also quilted 2 twin size but only with diagonal lines or stitch in the ditch. This is just what I need. Last year I made my first quilt top and need to quilt it so I can enjoy it this winter. These designs look like something even I could accomplish. I’m working on my frist quilt, it’s lap size! I have done from mini quilts up to a queen size. I am most comfortable, though, with twin size or smaller. I make all sizes of quilts, baby to King. However, I send anything bigger than a baby quilt out to someone else as I do not have the confidence to do it myself. I would love to win this book and practice for lap quilts. Love you and your show. I still have tapes from the 80s. I make 36 crib size quilts a year for Quilts for Kids, Inc., so I can truthfully say “crib size” is my most frequently sewn size! After watching your free-motion quilting video, I’m inspired to pull out my unfinished queen-sized quilt after more than twenty-five years. I quit working on it after trying to machine quilt in a disappearing-ink-drawn repetitious design. My wrists got sore after each session; I think I was too tense. Will try this time not to put so much pressure on my fabric as I guide it. Thank you for your dedicated, decades-long career and all the inspiration and helpful tips along the way. After reading your autobiography last year, I’m taking it upon myself to spread your coined word, “sewist” to my sewing friends. God bless you and your family; I’m praying for a miracle! I’ve always been a little afraid of free-motion quilting, but after viewing this video, can’t wait to try out this method! I make tiny to large and would love to learn fancier machine quilting. A longtime garment sewer, I started quilting when I retired. Recently bought a new machine with a wider throat area so I can machine quilt. Anxious to try free motion! I would love to have this book, I am finally trying my hand at machine quilting, I usually try to make a bed-size quilt once a year and then make as many quilts for Project Linus as I have time for this project. The quilts I make are usually lap or queen size. I just love finding new ways to be creative with the fabric and design. I just love being finding new ways to be creative with the fabric and design. Well, it’s not intentional, for sure, but I seem to end up making queen and king sized quilts the most! And I never keep them!!! I am not at all confident or good about free-motion quilting, even though I faithfully read almost every single blog post of Lori’s….I usually just pick out a nice quilt run from EmbLibrary, and stick it on a thumb drive, pop it in the Babylock Destiny II, and go from there. Months later, quilting is finished and the binding goes on. Usually right before the quilt is due to be delivered. Thanks so much for the chance to win Lori’s book – it could only make my life easier!! I enjoy making smaller wall sized quilts. If I could learn free motion quilting I would be more inclined to make bed sized quilts! I enjoy making smaller quilts including lap quilts, wall hangings, and table runners. Thanks for the great giveaway! My favorite quilts to make are baby quilts because they are just plain fun. The whimsy of free motion quilting is perfect for baby quilts, but also for quilted pot holders, table runners, and lap quilts. One day I might have time to try it out on a larger quilt for my king size bed. I have made quite a few baby quilts for family and friends. This book would be helpful for quilting baby quilts. Thank you for the chance to win. I quilt everything from mini quilts to table toppers, baby quilts to queen size. So far the quilting is uninspired quilt in the ditch, so I would love to learn these techniques! I’ve made quilts from queen down to baby. I love embellishing them (once made a frog in a pond quilt for my grandson and made a curled tongue that rolled up, a dragonfly with glitzy wings, and a fish with flapping flippers, just for him to play with). I like my quilts to make the recipient think happy things, and to feel all the love and prayers that go into its making. I’d love new ideas! I make baby quilts most often. I’m always needing one for baby showers and they are quick to make. I mostly make lap quilts they’re faster and I can make more to give away. Thank you for the chance to win. Good luck everyone. I mostly make lapsize quilts. They are easy to more around for free motion stitching. The size of quilts I make most are lap size. just started quilting, right now working on lap quilt, but want to make other sizes too. I haven’t yet tackled quilting, but would like to make a series of seasonal wall hangings and some table runners to match. Most of my quilts run between and lap and twin size, though I do have a queen size that needs finishing. I am a new owner of a long-arm (used but glad to have it) and I’m trying to get up the courage to load a quilt top that I have and start sewing. Lap size quilts are my favorite with baby quilts a close second. The quilt I am working on now, or for that matter some of my others are unique in size, not true twin, queen etc, you get the picture, So I love all sizes in their uniqueness!! Love this FMQ video instruction, am working on a t-shirt quilt(first one ever) needed your inspiration, thanks. I prefer table runners and wall hangings, because they do not take as long as bed quilts, and I can try out a larger variety of designs. I make smaller quilts, but I would like to make some twin sized ones for the ‘grands’. I only make baby quilts as my sewing area is really not big enough for larger quilts, which I found out when I did a twin quilt. Thanks for the chance to win this great book. Loved the videos on free motion quilting. I make 40×40 inch lap quilts for local nursing homes. Our guild just sent some to the hurricane relief in Huston. It would be fun to have a class and add more decorative quilting to these items. I call it “baby quilts” or micro quilts, I have made twins and infant size, with the burning desire to go big. I get distracted with new quilting ideas, so I keep them smaller so I complete the project. I’m not sure what size I have made the most of. I have been quilting for so long it is hard to keep track. I would love to have this book as I just can’t seem to master the art of FMQ. I have made quilts in all sizes, but my somewhat ambitious goal is to make a queen-size quilt for each of my 5 children and 15 grandchildren. I usually make lap quilts and Quilts of Valor. I’ve seen Lori’s ideas on Pinterest and would love to win her book. Thank you for the opportunity. Lap quilts are my go to size, also twin, table toppers and runners. Still trying to master FMQ and enjoy all your tutorials. I make mostly baby quilts and lap size quilts. Have made queen, double and single bed as well. Have just recently started attempting FMQ and really enjoying! I usually make crib size quilts for gifts, but have made a queen and full size quilt. I have recently made 3 miniatures for my granddaughter’s dollies. I like to make at least queen size usually! I have made quite a few baby quilts, as well a few king and queen quilts. I am slowly learning free motion by doing it on the baby quilts. Nancy you are amazing and an inspiration! I make all sizes of quilts but really enjoy the smaller ones since they can be completed in a shorter length of time. I am trying to learn free motion quilting so the book would be a great asset. I just finished a king size quilt for my personal bed and I would like to use Lori’s free-motion style to complete it myself instead of sending it out. I make mostly oversized lap quilts, and have made a couple of queen sizes for family members. Nancy – thoughts and prayers for you and your family. Lap quilts table runners and occasionally queen sized. I most often make twin size quilts but have made full, queen, king (Yikes!) and lap and baby too. I am always looking for interesting tops to piece and am trying to get the courage to free motion quilt a larger quilt. I particularly enjoy foundation paper piecing. I mostly make wall hangings as I’m 84 and can’t home quilt a large quilt any more on my domestic machine. I’ve done free motion for a long time and love it. The quilts that I make are usually charity quilts. So the majority are twin. Right now I am using up some scraps by making quilts for an animal shelter. Not a prolific quilter, but have mainly made bed quilts twin to king for my children. I’ve been working on a couple of throw size quilts that need to be quilted. I’ve make a few table runners so I can practice on something small. Almost feel ready to jump into one of the bigger quilts with the free motion. This book/ class looks like it will help me a lot. I like to make table runners and wall hangings. Mostly /baby/lap/throw size. Beginning to move up to double bed size. Have always loved all things Nancy Zieman and have followed you since the early 80′s. You have been a huge inspiration through all those years. Thank you for these posts and giveaways! I’ve only made two quilts so far. One was a crib size quilt from a panel and the other a twin size that isn’t quilted yet. I just found Lori’s blog, she is so easy to learn from. I like to make lap size quilts so I can see the finished creation faster ! Time wastes for no quilter. Lap or throw size quilts are my favorites and baby quilts! I’ve made many quilted smallish things: pillows, purses, jackets, Xmas stockings, table runners, wall hangings, lap quilts, and baby quilts, all using the simplest quilting possible. I haven’t had the nerve to try to quilt anything bigger. I hope this book would give me the courage to try something larger and more complex. I have only made baby quilt tops so far…working on doing the actual machine quilting and need all the tips I can find! I love making large quilts…at least twin size or larger. But, I hate the quilting process….would love to get better at the free motion quilting! I’ve only made twin size quilts (all for other people) but want to move up to a queen size for my bed. Maybe after I finish the twin I’m working on now for my son who just joined the Marines! As a beginner quilter, I’ve only done table runners, placemats and a lap size quilt (still in progress). I would love to learn how to do free motion quilting I’ve only tried stitch in the ditch and cross hatch. Mostly baby sized quilts lately. I do have a queen sized project started but it gets overlooked so I can make the baby sized ones for gifts. Most of mine are lap size. A queen is on the ufo list. I have mostly made lap-size quilts, and only a few baby quilts, of which I quilted by stitch-in-the-ditch method; and also made 2 king-size quilts, of which I had to send to a long armer, but I really want to learn free motion quilting. I usually make twin size quilts. They are just the right size for my seven grandchildren. Most of my quilts have been Queen sized. A few lap throws in the que now. I do mostly lap quilts – they make wonderful gifts and are easy to cuddle with during the winter months. I’ve started to do some free-motion quilting on my machine. I really need some practice, but am enjoying the process. I am rather new to quilting. I need all the help I can get. This book might be the starting point for me !! I make mostly large throw quilts and twin size. I love to make crib sized quilts for arriving babies and would love to add Lory’s quilting ideas to them. I find myself drawn to making bed sized quilts for my family members. I have been sending them out to longarmers to be quilted, though. I usually make baby and lap sized. I mostly do lap quilt sizes. I just recently did a wallhanging, but I mostly do lap size quilts. I tend to make baby, toddler and lap size quilts because they are easier to quilt in my machine. Also I donate most quilts to Project Linus. I usually make throw or ” sit on in a park” sizes. I usually make wall size or lap size quilts. I am rather new to quilting and am a bit daunted by larger project. Thanks for the chance to win this book. I am a wanna be machine quilter. Baby size, wall hanging and lap size are my faves. I love making quilts but would love to be able to quilt them myself. My favorite is lap size, with this book I can finally go beyond stitching in the ditch. Thank you for the opportunity to win this book!!! I have been making baby and throw size quilts, but will start making larger quilts now. The grandkids are growing older and need bigger quilts!! I love making lap size quilts. I would really love to get this CD so I can learn how to do free motion quilting on my domestic machine. Thanks!! I am going to be making lots of twin sized quilts since I have twin grandgirls but grandma has some queen sized and lap quilts for herself and her children. I’ve made all sizes but, I have a tote full of finished quilt tops because I’m afraid to ruin them if I mess up the free motion quilting. Sending them out can be so expensive. I would love this set and to let Lori teach me how to finish these quilts. I mostly make lap and twin quilts. project, hopefully if I win this would give me the confidence to try. Thank you for this opportunity and my thoughts and prayers are with you Nancy, God Bless you and your family. These days I primarily make lap-sized quilts for our guild’s charity quilting efforts. Thanks for inspiring me for many years!! I do throws and queen size most! I have been making lap sizes because they are quicker to finish and many charities take that size. I’m still trying to use up stash! I make mostly wall and throw size quilts. I usually make twin and queen size. I have several king size tops done, but quilting those are intimidating me. As far as quilting, my go to is stitch in the ditch or very simple S curves or echo quilting. I make Prayers and Squares quilts which are around 48×60. I usually make throw sizes and have also made a king size. I make all sizes but I do queen the most. My last quilt was a king and I really love it but I paid a long armer to quilt it for me. I am currently doing a queen and making it a quilt as you go. I have only mastered the meander quilting so would welcome more information on other patterns. Lap to queen size is what I usually make. I love to make baby or table runners to practice different patterns on. My quilts are usually lap-size. Occasionally, I will make a king, queen, or twin. It all depends upon the “reason” for the quilt. I mostly make lap size 64 inch to twin size quilts along with table runners and wall hangings… I use my embroidery unit to quilt the table runners and wall hangings as I haven’t mastered free motion quilting. 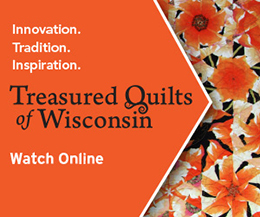 This DVD could help me learn how and gain confidence with FMQ. My favorite is throw size as are practical to quilt on my home sewing machine. The size is very practical for use as well. I usually make queen size tops. I am hoping to learn how best to quilt them. I typically make twin size quilts. I do my quilting with my regular sit down machine and these are the biggest I can manage! I usually make baby or lap size charity quilts for my guild. I would love to be able to do the quilting on these so I can turn in completed quilts and not just tops. Keeping Nancy and her family in my thoughts and prayers. Lori makes it look so easy. I’m a novice quilter and finished my first quilt top and I want to try my hand at quilting it freehand myself. I feel more confident and ready to try after watching this video……would love the book to keep me going. Thanks for all out time together, you have been in my sewing room for decades!! I make queen size quilts and quilt them on my sewing machine. What an inspiring method. Off to my machine! A lot of projects I have been working on. Wall hanging, baby quilt, rag quilt and some unfinished quilts. Thanks for all you do. I have made a lap quilt, table runners and panels and window panels. For a first time doer, am doing fairly well. Nancy has show some great ideas to do, now to fine the time to do them. I usually like the smaller ones, but I have done a few queen or king sized. I have also done a tree skirt. I make mostly baby size. These are for a group that provides them to the Ronald McDonald House in our town. Our goal is a quilt for every child who comes to the house. I am hooked on baby quilts right now: cuddle fabric, panels, patchwork, I love them all. Always a fun project that does not take a year to finish! I make twin to double mostly. I make twin size for my grandbabies. But I also make king size for the Mommy’s and Daddy’s of said grandbabies. I like to make wall hangings, table runners, mini quilts for holidays and seasonal quilts. I just returned from Alaska with a quilt kit depicting the Alaska wilderness. I will enjoy making it as I remember all the beautiful sights of my vacation. Love to do tablerunners! Excellent way to try a new technique-piecing, quilting, color selection. Always fun and good experimentation. I make more throws than anything. I practice on my table runners and hot pads. My quilts aren’t of any consistent size. I probably have more around the full size, but as a beginner quilter I tend to follow the pattern I’m making. I’d love to win this book as quilting on my home machine is something I really want to try. I have made many queen bed sized but I prefer lap sized. I usually make wall hangings, table runners, and double or twin size quilts. Love your videos. Praying for Nancy and her future medical experiences. I would say lap to twin but I do make at least one Queen and one King each year. i make mostly throw and twin size but have also made several double and queen sized. I am going to throw and lap sizes. Most of the quilts I make are baby size or throw size. I like to make queen size quilts, but any bed sized quilt is okay. I also sometimes make throws and table runners too. I prefer smaller quilts – baby quilts, wall hangings, lap quilts. They are easier to manage and I can make them faster! I perfer wall hangings as I like to do the quilting on my sewing machine, I like the suggestions & methods shown above. My favorite size is lap size, because then I can make more quilts!